2015 kicked off the revitalization of the Star Wars franchise on the big screen, but it’s not the only place that fans had been able to watch new material in a galaxy far, far away. Star Wars Rebels is currently in the middle of Season 2, and while the animated series has been on break the last couple weeks, it’s returning with new episodes next week. To get fans excited, a new trailer was released today, and while there were a lot of goodies to take in, what’s caught many eyes is a key link between the show and the latest movie, Star Wars: The Force Awakens: a lightsaber with a crossguard. I wanted to put a nod to this new history we’re seeing in The Force Awakens. It’s important to have these links between stories in major ways and subtle ways. Here you find a sword we’ve encountered before and it gives a little more context to something that turns up later. Although different lightsaber designs were seen across the previous six Star Wars movies, Star Wars: The Force Awakens was the first film in which the crossguard was introduced. 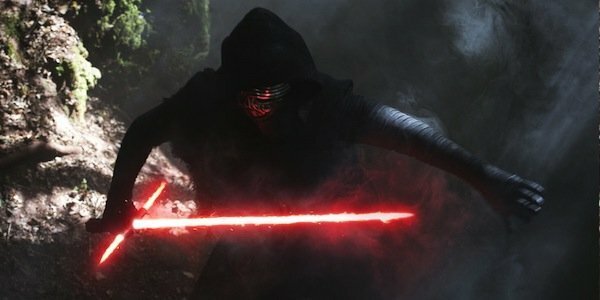 The First Order’s Kylo Ren used it many times during Star Wars: The Force Awakens, whether it was going up against another person with a lightsaber or throwing a temper tantrum with it. At least we know that this design isn’t limited to just dark side users. 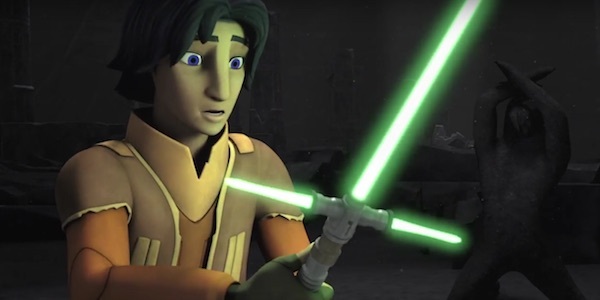 It’s unclear, though, whether Ezra will keep this lightsaber or stick with his trusty blue one. Another link to The Force Awakens in the trailer is a giant red beam shooting out of an ancient temple, calling back to Starkiller Base. However, Filoni made sure to note that this is an example of history repeating itself rather than the temple being a direct predecessor. Because we all know the Death Star occupies that spot. He also said the show is unlikely to reveal any big secrets from the movies, just like he wouldn’t want the movies to spoil what happens to any of the major Star Wars Rebels characters. Make sure to watch the new trailer in its entirely below to learn what’s coming up, including more of Princess Leia’s guest spot, a confrontation between Ahsoka Tano and Darth Vader and the return of more characters from Star Wars: The Clone Wars. Star Wars Rebels Season 2 will resume next Wednesday at 9:30 p.m. EST on Disney XD.